Right after a heavy workout, I am usually hungry and tired. I know I need to fuel my muscles, so I created this quickie snack for when a protein shake just doesn’t cut it. Measure out the cottage cheese and put in a small Cuisinart or blender. (I like to use my hand blender.) Blend well until smooth. Take 1 TBS of preserves and put in a small microwavable bowl. Heat for 20 seconds only! Just enough to make the jam a runny consistency. Check at 10 seconds because microwaves vary and the fruit heats very quickly. 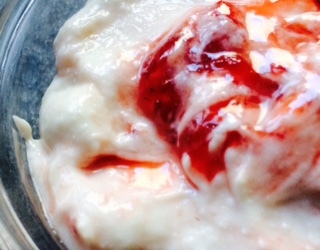 Put cottage cheese mixture into a bowl and slowly drizzle the preserves onto the cheese while gently folding it in. ** This recipe only works if you keep the portion sizes correct. You are just looking for a hint of sweetness. If you are trying to lose weight, do not add more than the required amount of preserves, or this snack will easily tip the balance into too many calories. The preserves work well after a workout as it is a quick release sugar that will help to pull the protein in for faster absorption. ← Are You Dieting Yourself Fat?